All parts are available online via the EdenPure website — set of 6 bulbs around $96 and all other parts are there also. call 1-888-499-8656 opt.3 to speak w/a tech.. Very good techs..
sorry, i no longer know if they have great techs anymore nor do i know if they are willing to help diagnose the problem w / you over the phone. 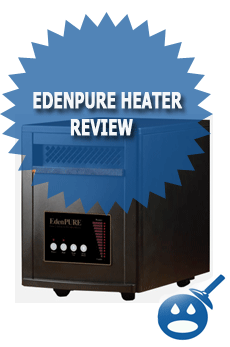 We purchased 2 of the EdenPure heaters last fall. 1 of them will on come on for a very short time when you first turn it on. It will no come on again no matter how cool in gets. Please help! I bought two EdenPure heaters last year. One of them right out of the box has a burned out light on the front pannel (part of the display that tells you where it’s set). I was assuming that it was just a diplay light burned out but querious as to if this indicates a more serious problem with the unit. I appears to be working fine but I’m didn’t see the cost savings in electric that I expected. It’s been pretty cold (at least for what we are use to)where I live for the past two weeks. I’ve been running just the one that doesn’t have the burned out LED to see what running just one cost. I’ll turn the other one on in a couple weeks to see what the increased usage is running two. If anyone one knows that the burned out light in the display is signaling a more major problem, please contact me by email. 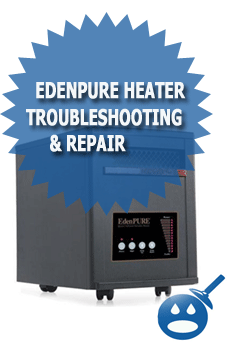 We recently purchased a reconditioned EdenPure and it will not put out any heat. What do we do? are you still having this problem? and if so, which model do you have? I can help you! We have a modal 500XL that will not do anything after you turn it on but beep. Do you know how to tell if the bulbs are burned out, or do you have any other suggestions? 99% of the time 1 of your 3 bulbs is burnt out when this happens.. and I would stress replacing all 3.. my email is chrishamilton34@yahoo.com please email me your phone # if you would like to know how get inside the machine and trouble shoot.. I would be more than willing to help. I have an edenpure Gen 3. I plugged the unit in yesterday for the first time of the year. The front panel lit up and then shut off. The machine actually turned on, and then went off . I checked he outlet and it is fine. Is there anything i can do to fix this ? Burnt fuse inside a possibility ? Any help would be greatly appreciated. i have a gen 4, i plugged it in to turn it on and the breaker tripped, so i took it to another outlet and it blew the breaker again. so i took it apart and all 3 bulbs are burn out and brittle……..but the fuse in the board isn’t blown????? is this normal….and where do i buy bulbs? eric, u can get the bulbs on line. just type in edenpure parts,there are several listed. they run about $32. i had the same problem, after 4 months of use it started tripping breaker. i ordered my unit from a company that sold them but went out of business. edenpure would not help unless i ship it back at my expence,so i just brought the bulbs. eden pure to me do not back there product. the us1000 i have had a bad board also from the factory. i also replace that. not sure if the board was what caused the bulb to blown. i do think it not good to cut then off and on a lot. I bought the Edenpure 1000. It worked good one season. Sent it away for repairs to the tune of $119.95 this past fall. It has already quit working. It’s disgusting how my heater was returned to me and what repairs were done were scribbled on a piece of paper. Edenpure Heaters are JUNK. Buy local if you can. Hey Chris- would you mind sharing how you do get the back off of eden pure to change bulbs. I have some to replace. Bob, when you find out how to get to the inside of the edenpure, would you send me an email [forward] turns on, runs for a bit, shuts off, then doesnot turn back on? are the red bulbs the thermostat so to speak?